Shirley Horrocks will present her film in person at its NZIFF screenings. There’ll be a Q+A at the following screenings. Shirley Horrocks, who met Callaghan while making her 2012 film Venus: A Quest, focuses here on his life in science. 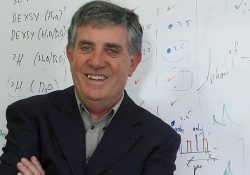 Through big brother Jim, classmates, colleagues and Callaghan himself – in a series of interviews filmed in 2010 – we journey from Callaghan’s childhood in Whanganui, to his work at Massey University, then to Victoria University of Wellington and the MacDiarmid Institute for Advanced Materials and Nanotechnology. There are dramatisations of schoolboy high jinks and footage from Callaghan’s trips to Antarctica. 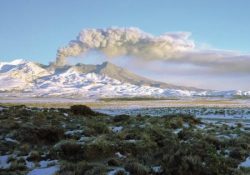 Callaghan’s life, and the film, takes a turn after his move to Wellington, where he applied himself beyond physics to art–science collaborations, economics and conservation. “Suddenly it became OK for scientists to work with artists,” says physicist Shaun Hendy about his former mentor. Poet Bill Manhire, cartoonist Dylan Horrocks, broadcaster Kim Hill and Weta Workshop’s Richard Taylor are among those who describe how Callaghan expanded the conversation between science and wider society and rallied people to his causes, many of which continue after his death. 6:15 PM, 24 July 2018 at ASB Waterfront Theatre. 11:45 AM, 27 July 2018 at Rialto Cinemas Newmarket. 1:45 PM, 28 July 2018 at Rialto Cinemas Newmarket. The Tuesday 24 July screening is a special fundraiser presentation with the proceeds going to the Cancer Society of NZ. Ticket details can be found on the Ticket Pricing page. NZ International Film Festival in Auckland on 19 July – 12 August 2018. Meet the filmmakers. 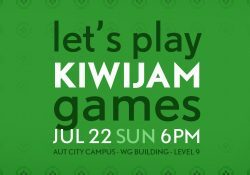 You are cordially invited to view a selection of local game developers work in progress and Kiwijam games. 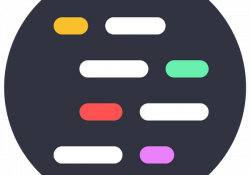 Kiwijam is a 48 hour game making event where participants work on either their own projects or start projects from scratch based on a nationwide theme announced at the event. On the last night of the event all participants, plus any other guests wanting to show their work, set up their work to be ready to play at 6pm. If you would like to come and see some current local talent and what they are capable of, please come along at 6pm, enjoy free nibbles and drinks, play some games, meet some devs and enjoy the vibe. Free. RSVP by 1 PM on 22 July 2018. A big thanks to AUT PIGSTY and NZGDA . Is React Magic? And how do I build an iOS app? Join us at Movio, where we’ll hear Kirk from Xero, and Rohit from Trail Software! By day, Kirk is a frontend engineer at Xero building tiny bits of content that go into bigger bits of content for your local internet box. Also by day, he is a graduate team lead building up the next lot of code magicians. By night, he does other stuff probably. Rohit is a senior Software developer for Trail Software. At Trail, they deliver next generation software to Mortgage and Insurance advisers to help them accelerate sales and grow their advice business. Rohit specialises in building web applications with mostly backend technologies like C# but has recently started the journey on building Mobile IOS Applications with Swift and Objective C.
Rohit will be sharing his story of building his first IOS app, along with some tips and techniques about using XCODE and the Swift Programming language. He will also be talking about how to make your app compatible with different iphone models(including Iphone X) and Native Deployment Techniques without using any third party apps. Remember to respect our Code of Conduct during all JuniorDev interactions. This is a safe and inclusive space for everyone! Movio as a venue sponsor! 30 St Benedicts St, Eden Terrace, Auckland. 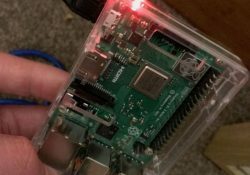 Wellington Home Automation Hackers are a meetup group of like minded people who are interested in home automation, whether it’s plugging in off-the-shelf IoT lightbulbs, or soldering your own PCB designs doing BLE – and everything in between! For our second meetup, we have two exciting presentations lined up. David Cole is going to do an introduction to openHAB, including comparing some of it’s key differences with Home Assistant (as featured last time). And Dave McKelvie is going to do an introduction to Android Things, Google’s platform for building smart/IoT devices. 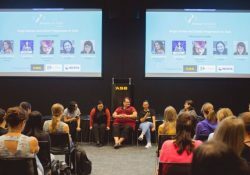 Women in Tech Auckland hosts regular events for our community, and our purpose is to create networks and amplify the voices of people from marginalised groups. We’re looking for speakers for our next event, on 31 July, which will be a series of short Lightning Talks. This is a format where you get 5 minutes to speak, you provide 20 slides, which are set to advance automagically every 15 seconds. For people who want to practice their speaking skills, Lightning Talks give you the opportunity to present for the first time without having to create a formal presentation proposals, and its short so its a great intro to speaking in public. A good lightning talk is insightful, inspiring, thought-provoking, useful, humorous, controversial, or enlightening. You do not have to be an experienced speaker! Your work and time are valuable even if you have never spoken before. We are happy to meet with you for coffee and brainstorm ideas, as well as attend a dry run of your talk and provide constructive feedback. Let us know if you’d like to do a Lightning Talk using this form. We value the participation of each member of our community and want all attendees to have an enjoyable and fulfilling experience. Please familiarise yourself with our Code of Conduct ahead of attending a Women in Tech meetup. Many thanks to ASB (https://www.asb.co.nz/) for sponsoring and hosting this event. The IoT Auckland Meetup is invited to the Newmarket Innovation Precinct. Hear an introduction to the NIP and the IoT projects underway. Jarmo Crivelli, Business Development Manager at Uniservices is presenting on using the Internet of Things in the Mining and Resource sector. These are examples of IoT innovation to achieve more automation and address challenges that are faced. Hear about the pros and cons of this approach. We’re pleased to have the invitation from NIP and we are discussing future collaboration for the benefit of the IoT Auckland Meetup membership. How do you think we can accelerate IoT in NZ together? John McDermott will have a update from the LoRa Alliance Annual Conference. 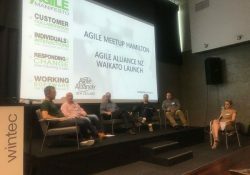 As always in the agenda, networking with group members to make new friends and discover what others are working on; local IoT news; update on recent IoT Auckland Meetup activities; and your chance to quick pitch a project or request for help. A snack meal is included. That’s what your ticket pays for, thank you. Please come along to learn, discover and network. We are pleased to announce our second Wellington impactNPO Charity Hackathon. To be part of this amazing weekend, all you need to do is get a ticket. The weekend starting on Friday 13th July from 6 pm to 8 pm with networking, charity introductions, and team forming. You will be volunteering your weekend (Saturday 14th July and Sunday 15th July from 9 am to 5 pm) where we all will be giving back to the community by providing IT solutions to charities. We will be providing the food and drinks this weekend to keep you well fed and energised! First and foremost we aim to help local non-profits. NPOs often have quite a lot of IT challenges. Through this, you may find that you meet new people from different companies or industries, find contacts if you’re looking for work, or get to step outside of your comfort zone and learn something new through a weekend project. Or just have a fun weekend working in a team to deliver something that is really useful to the community! The charities you will be helping at this event will be announced shortly. A big thank you to our lovely sponsors, emhTrade who are sponsoring the food for the weekend and BizDojo, via the Collider Programme, who are sponsoring the venue. This depends on you, your team and the needs of your chosen NPO! Over the many successful weekends we have run, we have helped numerous NPOs with websites, IT infrastructure, design, branding, content as well as general advice. Free. Please register for a ticket. We are making the world a better place by facilitating connections between charities and individuals intent on enhancing their impact on the world. 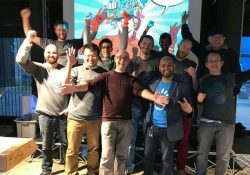 We coordinate and support hackathons for charities, but our larger mission is to help individuals and organisations to run their own events in their own communities.